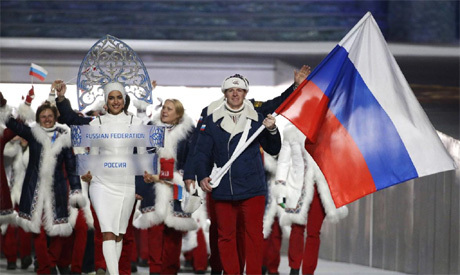 The Russian Olympic Committee has appealed a Moscow court ruling which sought to overturn a doping disqualification against a double gold medalist from the Sochi Winter Olympics. The Moscow City Court ruled last month that bobsledder Alexander Zubkov - who carried the Russian flag at the Sochi opening ceremony - could keep his medals because a Court of Arbitration for Sport decision to uphold his disqualification wasn't valid in Russia. That was a challenge to the authority of CAS and the International Olympic Committee. The ROC said on Wednesday the CAS ruling was valid under international law and that ignoring it could lead to more sanctions against Russia from the IOC - even potentially threatening Russia's place at the 2020 Olympics in Tokyo. Zubkov won the two-man and four-man bobsled events at the Sochi Olympics but he was disqualified by the IOC last year. The verdict was upheld by CAS. Zubkov and his teams remain disqualified in official Olympic results, but the Moscow ruling could make it harder for the IOC to get his medals back. Swiss and Latvian teams are in line to inherit the gold-medal spots. The IOC's case against Zubkov was based on testimony from Moscow and Sochi anti-doping laboratory director Grigory Rodchenkov, who said he swapped clean samples for ones from doped athletes, and forensic evidence that the allegedly fake sample stored in Zubkov's name contained more salt than could be possible in urine from a healthy human.